A full-bodied whisky with notes of iodine, Oban possesses a unique, characterful presence that is to be discovered within the Classic Malts Selection. This whisky was awarded a Silver Medal at the San Francisco World Spirits Competition 2018. 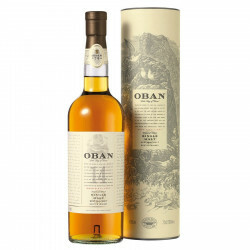 Oban created a remarkable Single Malt in one of the oldest licensed Scotch distilleries. Selection of barley according to very precise requirements specifications, distillation in lantern-shaped Pot Stills, slow condensation in "worm tubs" and a maturation of at least 14 years in oak casks (bourbon), bring to Oban a unique character bursting with malt, iodine, salt, fruits and wood fire. 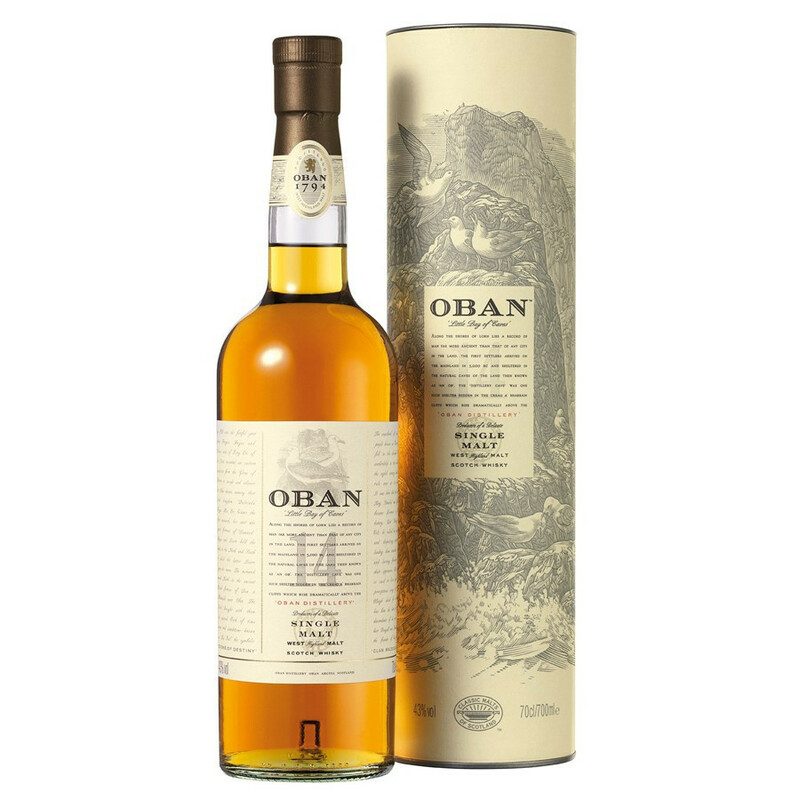 Oban style is full-bodied, with notes of iodine and light smoky spices. Traditional methods enabled the distillery to preserve the finest whisky quality, for now two centuries. The unique character and quality of Oban whiskies ranked the distillery in the Classic Malts Selection. Crossing point to the Hebrides, Oban is a well-protected harbour making the city the capital of the West Highlands but also the natural link between the great land and the islands. Founded in 1794, the Oban distillery has been established by the Stevenson brothers. Partly redesigned in the 1890, it is still one of the oldest and smallest distilleries of Scotland. Engulfed in the small strip of land between the mountains and the sea, the small and lively town of Oban huddled on the distillery. This geographical impediment explains why the distillery never spread and had troubles meeting a growing demand. The unique character and quality of Oban whiskies ranked the distillery in the Classic Malts Selection. Created more than 20 years ago, this selection recognises Single Malts crafted in the tradition of iconic distilleries, and offers the most impressive whisky styles Scotland has to offer. Nose: abundant citrus and fresh fruit bouquet (orange, lemon, pear) with notes of sea salt and peat smoke. Palate: thick with late autumn fruits flavours. Dried figs and honeyed spices, as the malt wafts seaweed and wood fire. Finish: of good length, mellow finale blending oaky wood with the slight bitterness of iodine. Silver Medal San Francisco World Spirits Competition 2018. Silver Medal San Francisco World Spirits Competition 2011. Oban 14 Years Old will be in perfect harmony with Saint Marcellin or Avruga (herring fish eggs). Try it also with salted butter caramel macarons, for a gourmet coffee time with a twist.